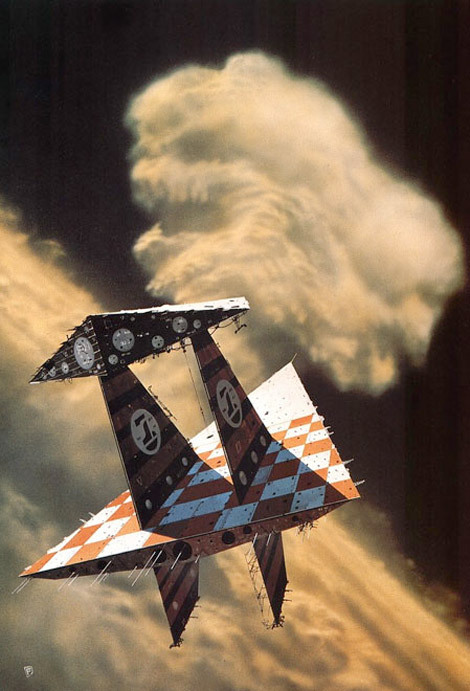 Famous sci-fi artist Chris Foss, whose style is instantly recognizable from the colorful checkered patterns to the abstract shapes and trippy ships of all shapes and sizes, was particularly active in the 70s when Lucas was researching like a mad man for his upcoming space western. Foss worked on many outlandish concepts in that time, but one in particular echoes the Imperial Star Destroyer that so wooed audiences in that iconic opening shot of Star Wars. Maybe Lucas came across AE van Vogt’s 1973 book Moonbeast, or maybe he picked up the February 1974 issue of Science Fiction Monthly where it was reprinted. Or maybe Ron Cobb or Dan O’Bannon brought over some of Foss’s work from the ill-fated production of Alejandro Jodorowsky’s Dune, which had been in production around the mid-70s, and on which Foss had also worked. Regardless, into the grinder it went, or at least it seems very likely it did. 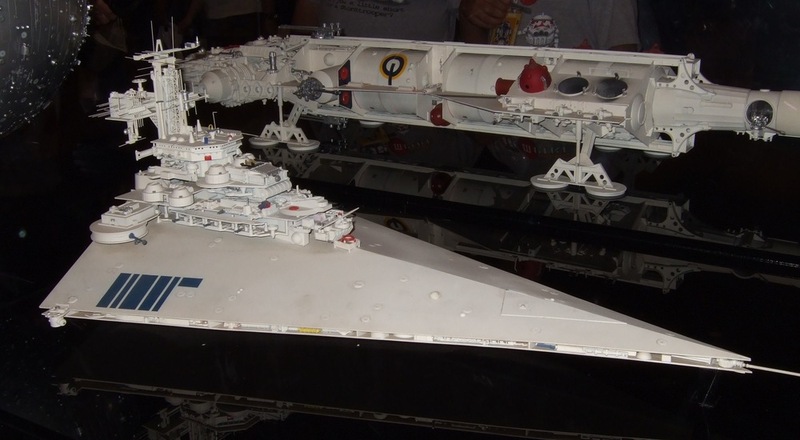 And once filtered through Colin Cantwell’s John Berkeyesque naval Star Destroyer (see elsewhere) and Joe Johnston’s mechanical form language; et voila, Imperial Star Destroyer. Joe Johnston's initial concept drawing. Foss himself seems to have liked the idea enough to reuse it in 1978 for The Bloodstar Conspiracy by Stephen Goldin and EE “Doc” Smith in what is a nearly identical painting. “When I first saw Star Wars, and the triangular spaceship came on,” he later remarked in a short YouTube video, “I was actually quite annoyed because I thought ‘hahaha, they’ve nicked that from the painting I did’. The Bloodstar Conspiracy, which I did for Panther ages before, and in fact I did have a minor run-in with two representatives from the studio,”foss though he didn’t get to finish the thought before the video cut.